To Wheat or Not To Wheat…. I want to talk about why I am happy that I gave up WHEAT. Have you read the Wheat Belly? It is all about how scary wheat is nowadays. It isn’t the same wheat that your grandma bought and ate. It is modified and it is really “frankenwheat”. I have noticed that after I gave up eating wheat due to the high carb content in it, I was feeling better all the way round. My bloated belly went down, my bathroom issues were going away, less bloat, pain, the runs. I was losing weight quickly for the first time. I never lost that much on other diets, because those diet had wheat products. My friend, Kathy, was having bloat, belly and weight issues and she thought I was crazy to give up wheat products. Then she read the Wheat Belly and she gave it up after she read how scary wheat is to the body. She looks and feels better than I have seen her in years! It is hard at first to give up bread, but after a couple of weeks, you don’t crave it anymore and it is so worth it. I get burgers protein-wrapped in lettuce or on a salad. It really isn’t a big deal. I am saving about 40g of carbs for the bun! I lost weight and I am keeping it off because I said b’bye to bread. Once in a while, I have a Westernbagel.com Perfect 10 (10g net carbs) and that gets me through a craving that hits once in a blue moon. But, to poison myself with it everyday is ludicrous–especially now that I know what it does to me. Also, once in a blue moon, I can have two small slices of GLUTEN-FREE pizza and I will do ok, and not gain weight….but I would if I did this often. So, you don’t have to never eat wheat again, but the less you do, the better for you in general. It is not really a food group that should be on the chart. Eat your proteins, vegetables, fruits, salads. You will do great. And what about gluten? It is not a necessity in your diet. It is a protein in wheat, barley and rye, but it is not necessary. You can get what you need from eating more vegetables. 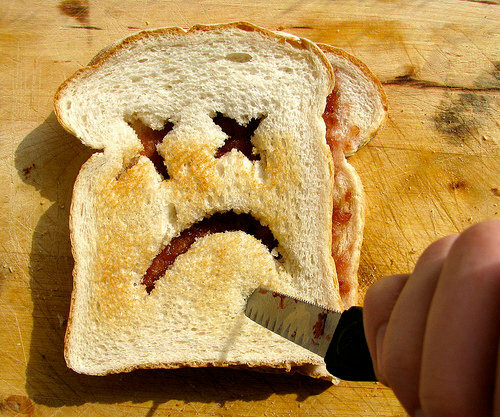 Read this article on how gluten and wheat are not good for you! So, I live a paleo or mediterranean lifestyle food-wise. I feel great, more energetic, look better and I am skinny. You can do it too. It is a LOT easier to lose weight doing this and keeping it off.